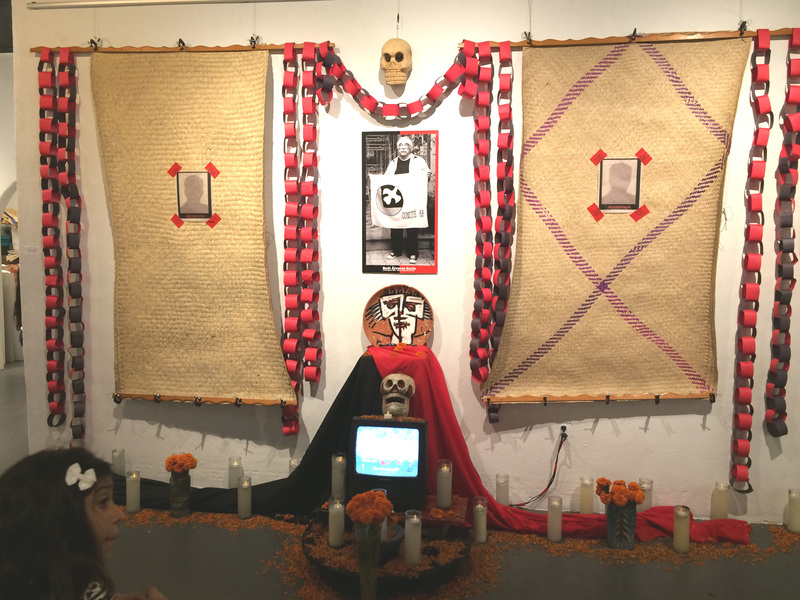 Día de Los Muertos Altar dedicated to los perdidos en Tlatelolco '68 and the 43 in Ayotzinapa. Courtesy of J.A. Aguirre. To most Angeleños* and roughly two million visitors from across the city, the state, the country and abroad who visit annually, Olvera Street is little more than a touristy relic, an antique collection of structures and buildings that once functioned as the city’s bustling center. For them, it provides a portal to a quaint, picturesque and romantic—if reductive and grossly idealized—vision of an idyllic colonial pueblo once home to the original 44 Native American, African, European and Mestizo settlers who founded Los Angeles along the banks of the Río de Porciúncula (Los Angeles River) in 1781. Declared a state park through the efforts of preservationist and persistent civic booster Christine Sterling, the cradle of Los Angeles had already fallen on hard times by the 1920s when she turned her attention to its shuttered adobe and early brick buildings. Its Californio grandeur had given way to a reputation as a seedy, unwholesome quarter abandoned for booming downtown developments on and around 6th Street near what is now Pershing Square. Appalled at the dilapidated state of an important historical patrimony, Sterling envisioned restored adobe houses complimented by a colorful Mexican market as well as shops and restaurants that would evoke a pleasant return to some imagined pueblo past and a Mexico she had never seen, nor would she ever see. Indefatigable, she sold downtown movers-and-shakers, including L.A. Times publisher Harry Chandler, on the idea by minimizing the original Mexican merchants, landed gentry and public servants while emphasizing the U.S. military leaders who had taken up temporary residency there on campaigns and the captains of industry who had bunked there at the start of their careers. It was amidst this allegedly benign Hollywood stereotyping and Disneyland-ification of L.A.’s Spanish and Mexican past in stark contrast to the simultaneous and forcible deportation of U.S.-born citizens to Mexico during this regrettable period in Los Angeles history that Mexican muralist David Alfaro Siqueiros was commissioned to paint a mural at Placita. Covered over with a coat of white paint shortly thereafter, the mural was an indictment of imperialism and is now the subject of an interactive interpretive center focused on the mural, its censorship and eventual restoration. A number of local artists and arts advocates fear a similar process of erasure, one which seeks to make Placita Olvera less polemical and more ethnically neutral is once again underway. The effort, they say, primarily—though not exclusively—targets the Mexican Cultural Institute (MCI), an anchor Olvera Street tenant for decades and a beloved community art space. The Instituto Cultural Mexicano—as it was originally named—was established in a multi-story building in 1991, as a fully-chartered, tax-exempt non-profit developed to foster cultural exchange between the people of Mexico and the U.S.
“I presented myself as an artist. There was interest in my work,” he adds. “So we started collaborating.” According to Aguirre, a visual artist formally trained at the prestigious Academia San Carlos in Mexico City, Aguirre had also studied in Chicago and Austin, before coming to Los Angeles where he was soon being offered public art commissions and simultaneously working with Sister Karen Boccalero at the renowned Self Help Graphics print atelier. “At that time, the MCI was a really a wonderful institution. It opened with an exhibition of work by Rufino Tamayo… a high caliber presentation of Mexican culture,” Aguirre says. Aguirre explains that the MCI was a requested by the community. Based on a similar space in San Antonio, Texas developed with initial support and funding from the Mexican government via the Consulate General, Angeleños approached their own Cónsul to ask why Los Angeles, bigger and with the more Spanish-speakers than anywhere except Mexico City, didn’t have their own “instituto,” he recounts. The Biscailuz Bldg. (1926)—where the MCI’s administrative offices were located until a recent punitive lockout Aguirre ascribes to El Pueblo de Los Angeles Historical Monument staff—housed the offices of the Mexican Consulate for approximately 30 years before its move to its newer location near McArthur Park. Its exterior façade still bears a murals painted between 1974 and 1978 by Italian American artist Leo Politi, a renowned children’s book author-illustrator, painter and sculptor who once painted portraits and crowd scenes in the Plaza for sale. The lockout, Aguirre explains, was based on a minor administrative glitch that was corrected swiftly. But El Pueblo de Los Angeles Historical Monument General Manager Christopher Espinoza has yet to return the organization’s keys to the rightful board designee. In this case, Aguirre is the organization’s appointed representative and simply wants to help restore the organization to its former prominence with quality exhibitions, as well as educational and musical programming that are not only authentic reflections of Mexican art and culture and history, but groundbreaking, visionary and provocative opportunities for discussion and debate. Some time ago, Aguirre recounts, the vintage sign painted above the doorway to the basement gallery as part of the Politi mural—based on the annual “Blessing of the Animals” Olvera Street tradition—featuring a hand-lettered legend reading “Consulado Mexicano” in large type over “Pasaportes Mexicanos” written in a less decorative and much smaller type was repainted so as to have Politi’s original lettering removed. The mini-white wash was an eerie echo of what had happened to the Siqueiros América Tropical mural a generation before, though it could easily all have been just a misunderstanding, Aguirre offers. Someone may have wondered—perhaps even somewhat reasonably—if the sign, while only an element in a site-specific mural, was not still somehow conveying to visitors that the building. still housed the consulate and provided passports. It is not farfetched to image someone might have mused over this aloud to maintenance staff, who then might simply have assumed it was a good idea to fill in that part of the mural with a solid color matching the background of the artists’ rendering of an imagined door sign where the text appeared. But then being that El Pueblo is a division of L.A.’s Department of Cultural Affairs, whoever suggested the removal of the lettering on what looked very much like an actual sign and not a part of a historically significant mural would have been quickly and quietly informed that it is, in fact, a criminal act to alter works of public art which are protected by law. Whatever the case may have been, the “Consulado Mexicano” and the “Pasaportes Mexicanos” legends were restored.What remains unclear, however, is which highly specialized art preservation company, among the few in Los Angeles certified to perform such work, was contracted to restore Politi's original artwork and eliminate evidence of its alteration, how much the restoration cost and who approved the expenditure. Aguirre says nothing when asked about the matter and how it all may have transpired. As long as the integrity of the artists's original work was preserved, he says, then he has no reason to venture a theory or opinion on administrative decisions or issues with no direct bearing on community efforts to build on MCI's past success and work collaboratively with Olvera merchants as well as the El Pueblo office to develops quality programming. Despite Aguirre's non-committal response, if there was an unspoken campaign to excise Olvera Street’s more overtly Mexican antecedents, it would make sense that Politi’s realistic signage might have drawn inordinate interest from someone who may not have been aware of the legalities and the liabilities El Pueblo could have incurred as a consequence of even the slightest alteration of the Biscailuz mural. Beyond that, Aguirre adamantly refutes the accusation made in 2015 that significant MCI space was being used for purely personal projects. The La Opinion article in which it was reported refers to an eviction notice from city staff that was issued. Since Aguirre and the organization continued to present programming at Placita Olvera until the most recent, and characteristically punitive lockout, the eviction notice was obviously not approved by the Pueblo Commission, whose members are all politically appointed and charged with serving as a sort of citizens oversight group. The record, in terms of programming, remains clear. Despite the lack of a salary and operating on a shoestring budget, Aguirre was and is still able to effectively leverage his considerable stature in the art community as a visual arts teacher, curator, cultural worker and organizer who has lived in Los Angeles since 1986 and whose public art commissions stretch across the country. This has allowed MCI programming to continue despite the current lockout. This month, for example, MCI presented a classic Mexican film, Macario, at the County Library in lieu of the Día de Los Muertos program he had hoped to bring to La Placita. Although there had been discussions around the possibility of rebuilding a relationship with the previous Mexican Consul General, Aguirre explains, they were tempered with the election of Mexican President Peña Nieto. “Peña Nieto is from finance and business, an industry guy,” says Aguirre, indicating the likelihood of government arts and culture investment beyond Mexico’s borders during Peña Nieto’s “sexenio” or six-year term was less than slim. “Sure, it would be nice to have the Consulado’s support once more and begin sponsoring scholarships for Chicano artists to study in Mexico or to bring artists here,” adds Aguirre. Lamentably, reveals Aguirre, when he introduced himself to the new Cónsul General appointed by the Peña Nieto administration to head the Mexican diplomatic mission in L.A., he was greeted coldly. “I told him we were in discussions with his predecessor about renewing the relationship. He said he wasn’t interested and that he knew all about me,” says Aguirre, still openly wondering what might have been said to the Cónsul, when and by whom. Changes in staff and board make up at MCI as well as two previous transitions in Mexico’s federal government had led, he continues, to an amicable and mutually agreed upon parting of ways between MCI and it original parent entity long before he’d accepted the post as director. When he asked Espinosa about the possibility of lifting the lockout on a probationary basis so he, the MCI Board and several volunteers could get back to the serious work of rebuilding the organization, the El Pueblo General Manager acquitted himself by saying the decision was no longer in his hands. According to Aguirre’s version of the exchanges, Espinosa openly suggested that the ultimate decision was within the purview of Councilmember José Huizar. Ironically, an anonymous source at City Hall tells Brooklyn & Boyle that Espinosa was given the post at El Pueblo by Antonio Villaraigosa as a promotion in honor of loyal service as the former Mayor’s Capital Projects Director. The same source cites unconfirmed rumors that Espinosa’s mom is also a current city employee. In light of all this, another rumor does little to allay the suspicion that Espinoza and his staff are trying to “clean up” the image of Olvera Street in advance of several upscale residential developments going up nearby. “He [Espinosa] was overheard telling someone that he was just waiting for Huizar to term out of office so he could have the statue of Antonio Aguilar removed,” the source confides. At press time neither Huizar or Espinosa could be reached for comment.